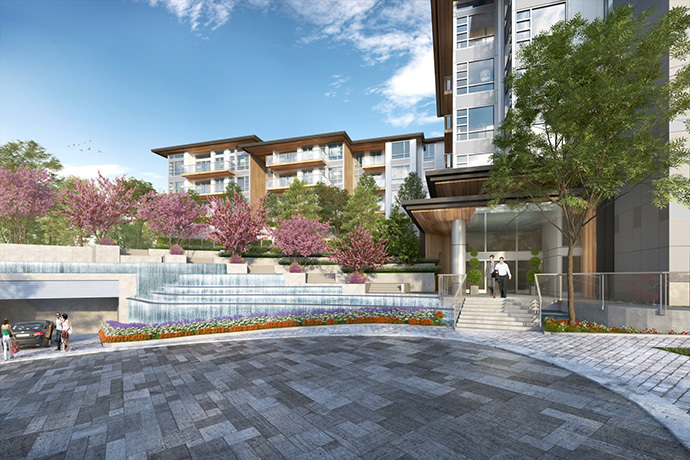 Burnaby’s highest value in luxury living is now here! Launching April 2016, the new Brentwood Burnaby Escala Condos by Ledingham McAllister will feature an introductory priority savings of up to $10,000*. This limited time offer is only for the first 200 presale Burnaby Escale condo buyers. 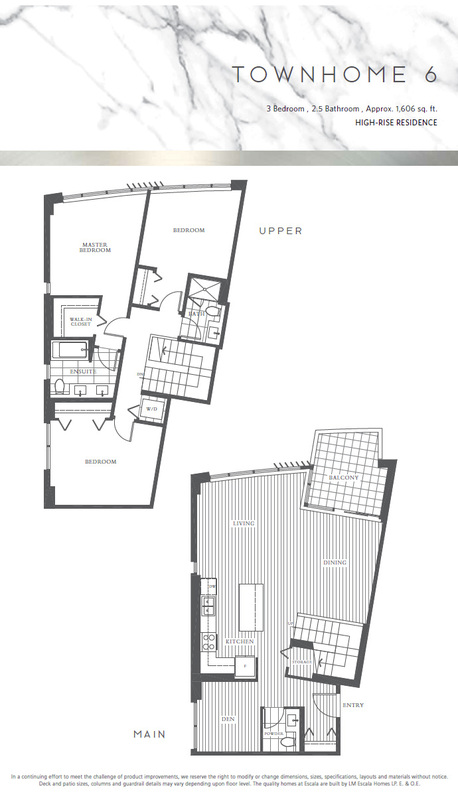 1 bedroom plus den suites start from $342,900** and 2 bedroom homes start from an affordable price point of $475,900**. Some of the impressive features of the new Brentwood high-rise tower include unmatched panoramic views in all directions, 9 foot ceiling heights in most suites and room as well as air conditioning**. In addition, home owners and residents at the new Burnaby Escale Brentwood condos will have access to over 15,000 square feet of five star private amenities! The offering will include high-rise residences, low-rise residences and a few townhouses for sale. The 42 storey Burnaby Escala high-rise tower will feature townhouses, one+den, 2 and 3 bedroom homes (total of 369 homes for sale) in addition to two 4 storey low-rise buildings with townhomes, one+den, two and three bedroom floor plans (total of 151 homes). The estimated completion date is Spring 2019. Please register your interest on this page for more details! Elevating the aesthetic of the thriving Brentwood neighbourhood comes Escala by Ledingham McAllister. Featuring a soaring 42-storey high-rise accompanied by two West-Coast contemporary mid-rise residences, homeowners will have access to unprecedented luxury only experienced at the world’s finest hotels, including dramatic water features, elaborate landscaping and over 12,000 square feet of five-star, hotel-inspired amenities. Register today and be the first to learn about exclusive details privileged only to our priority clients. You can visit www.escalabrentwood.com for more information. The sales centre location is at 1710 Gilmore Avenue Burnaby. The developer is LM EScala Homes LP and the architecture is by award winning IBI Group Architects and Integra Architecture. There are also 50 electric vehicle charging stalls, bike storage locker for each home, in suite security system for ground level homes, low-E double glazed windows, FOB entry and the Traveler’s Insurance home warranty coverage. As mentioned above, the luxury Brentwood condos at Burnaby Escala by Ledingham McAllister features both high-rise and low-rise residences. The amazing features of the tower residences include a beautiful entrance lobby with marble flanked by extensive water features, lush landscaping and over height fireside lobby lounge. The airy 9 foot ceilings are spectacular and the expansive windows give you lots of light and sweeping views in all directions. The bedrooms in the high-rise Escala condos in Burnaby feature carpet (nylon 32 ounce) in addition to laminate floors in the entry, kitchen, living/dining with an option to upgrade to engineered hardwood. Also, all windows have deluxe roller blinds and the master bedrooms will feature spacious walk in or walk through closets. There are two designer palettes that include Dawn and Dusk. 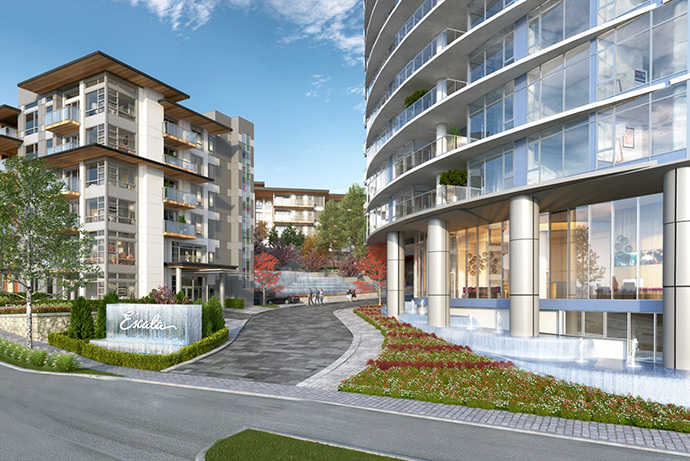 All Burnaby Escala high-rise condos will have balconies or outdoor living spaces. 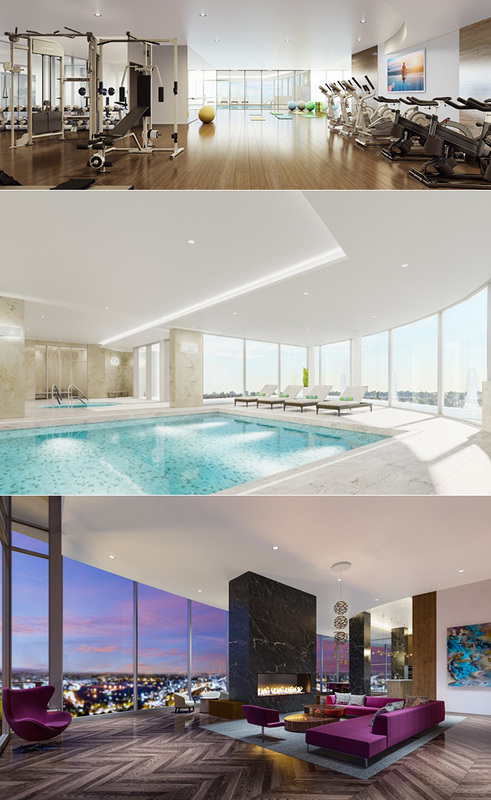 All Escala Tower residences will have air conditioning in addition to pre wiring for high-speed internet and digital cable, ceiling light fixtures in bedrooms and front loading, energy efficient washer and dryer by Whirlpool. The carefully crafted kitchens will feature Caesarstone counters with contemporary tile backsplashes, soft close cabinets and full size stainless steel appliances that include a 5 burner gas cooktop, thermal oven by KitchenAid, 30” French door fridge with interior water dispenser by KitchenAid, hood fan by Venmar, KitchenAid top control dishwasher and Panasonic microwave. Other kitchen features at the high-rise Escala Brentwood condos include sleek and discreet built in pull out waste bin, under mount double bowl stainless steel sink, Kohler single lever Purist faucet and overhead recessed pot lights. The bathrooms at the luxury Brentwood condos include a large soaker tub with porcelain surround tile, modern frameless glass shower with surround and Kohler Honesty shower head in most main bathrooms. There are also soft close cabinetry and Caeserstone vanity top in ensuites with under mount sink and premium faucet by Kohler. As a resident of Escala condos in Brentwood Burnaby, you are enrolled as an elite member of The Escala Club. Its 15,000 square feet of private, five-star amenity space sets the standard for stay-at-home sophistication. Some of the amenity spaces that are available to your exclusive use includes an indoor pool and spa, steam and sauna rooms, private fitness room and yoga studio, stylish fireside social lounge and a state of the art catering kitchen. Other Burnaby Escala Club condo amenities include a resident only concierge, two private hotel style guest suites, music room, movie room and a billiards/ping pong room. Of course, one of the best features of this striking Brentwood condo tower is its location that is close to all urban amenities and conveniences you could ever wish for. Life at Escala is low maintenance and easy, being located in a premier destination neighbourhood where metropolitan and community living meet. Brentwood Burnaby is not only the gateway to Vancouver, but proudly stands alone as the most desired community in Burnaby. From lush open parks to renowned shops and restaurants, the Burnaby Escala Condos in Brentwood real estate market are also just mere steps away from the Gilmore SkyTrain Station, one block to Vancouver and ten minutes to BCIT and 15 minutes to the main SFU campus. Other great community amenities include Whole Foods, Save-On-Foods, Brentwood Town Centre, Cactus Club Café, JOEY Burnaby, Winners, White Spot, Costco, The Keg, Home Depot and Winners. There are also numerous schools for kids of all ages in addition to the Willingdon Community Centre. There’s a wide variety of floor plans in both the high-rise and low-rise residences for homebuyers to choose from. 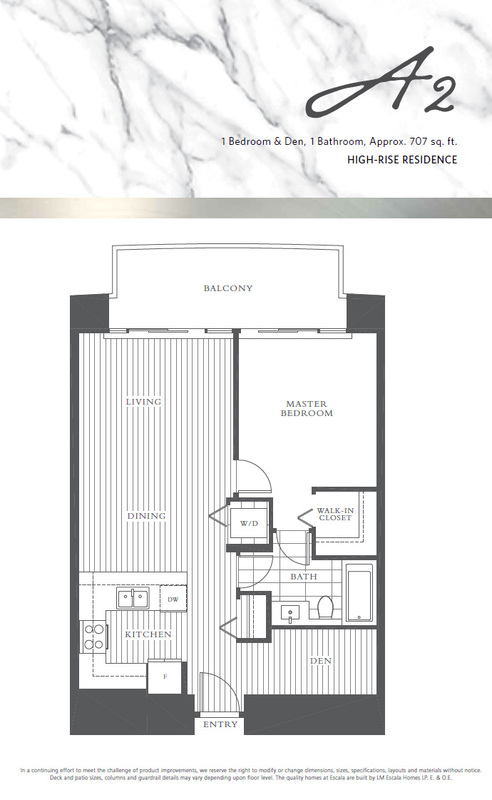 The Burnaby Escala high-rise condos starts with the 1 bed and den/1 bathroom floor plans from 660 square feet all the way to 2 bedroom plus den with 2 bathroom layouts around 898 square feet. The high-rise tower also features townhouse plans that range from 2 to 3 bedroom (plus 2.5 bathrooms) between 1225sf to 1606 square feet. All are 2 level plans with powder rooms and significant outdoor living spaces. The new Burnaby Escala low-rise residences will feature 1 bedroom plus den and 1 bathroom floorplans from 635 square feet to 2 bedroom plus den/2 bathroom ‘adaptable’ floor plans from 906 square feet. There are also family sized 3 bedroom/2 bathroom low rise layouts in the 900 square foot range. The Escala low-rise building will also feature spacious townhomes (2 bed/2 bath between 977-1124sf and some with dens) all over 2 levels of living. There is also a 3 bed/2.5 bath Escala Burnaby townhouse around 1154 square feet. 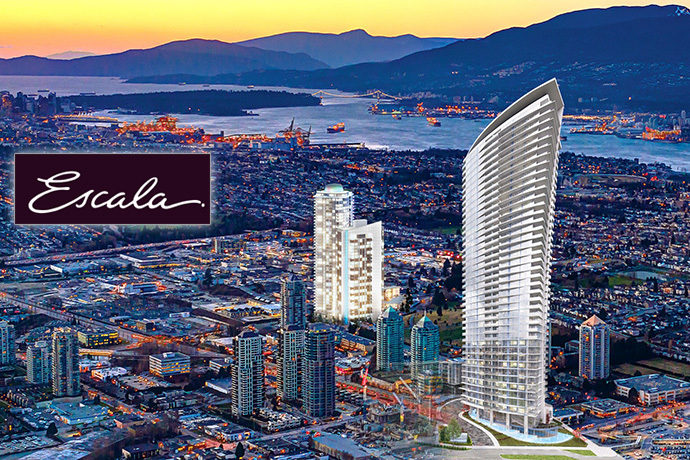 * Some conditions apply for the presale Burnaby Escala condo priority savings of up to $10,000. This is not an offering for sale. Any such offering can only be made by way of a disclosure statement. The developer reserves the right to make changes and modifications without notice. Renderings of the new Burnaby Escale Brentwood condos are artist renditions only. 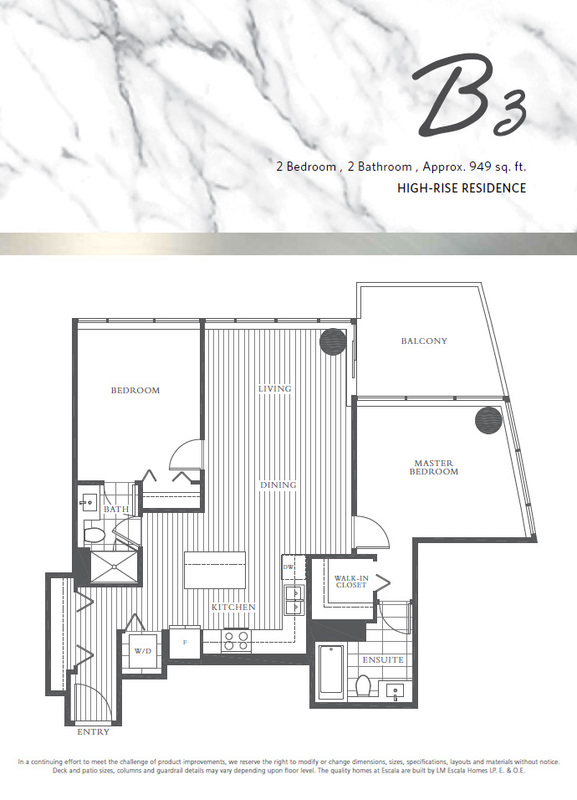 ** Available in Escala Burnaby condo highrise homes only. Prices and promotion are subject to change without notice.